Khok thong ("Golden Mortar") is the name of a popular isaan (North-Eastern Thai) restaurant near my house. For those of you not familar with ahaan isaan, this cuisine has a lot in common with the food of Laos, just over the Mekong River. 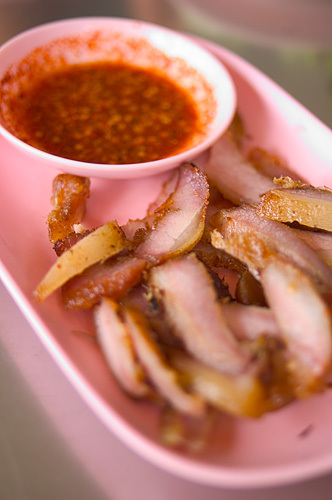 This means a lot of grilled dishes, salads and soups, with very little of the Chinese-style fried stuff seen in Bangkok and southern Thailand. 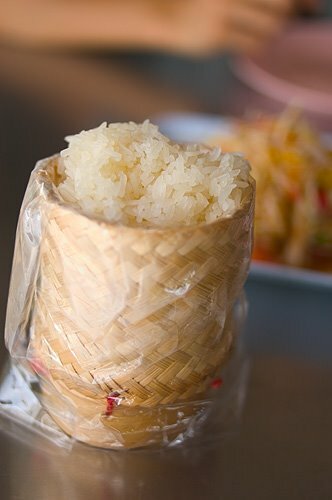 Additionally, people in isaan tend to eat glutinous or "sticky" rice with all their meals. This is a particular kind of som tam that includes khanom jeen, fermented rice noodles. This may seem an odd combination, but the noodles do a great job of mellowing out the dish, which is typically very spicy. The yellow bits are the peel of ma kok, a kind of sour fruit (I think it's called Chinese olive, or something similar to that) that adds a tart flavor to the dish. (Ma kok, incidentally, is the origin of the name Bangkok, meaning a plain where lots of ma kok trees are found.) 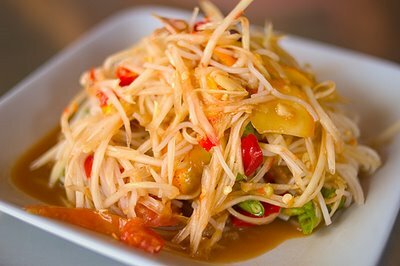 I'd venture to say that right now som tam is probably the most popular food in the country; EVERYBODY loves the stuff, and it can be found on virtually every street corner. This dish takes the fatty fatty meat (sometimes also known as the "collar") grilled and typically served with a spicy/sour/salty dip. which is eaten with the hands and rolled in a small ball before being dipped in any of the dishes present. The container its served in is known as a katip and is meant to hold the rice while at the same time allowing heat and moisture to escape. Unfortunately most restaurants put the rice in a plastic bag, which really defeats the purpose and often results in a mushy, sticky mess. Fortunately that wasn't the case today. 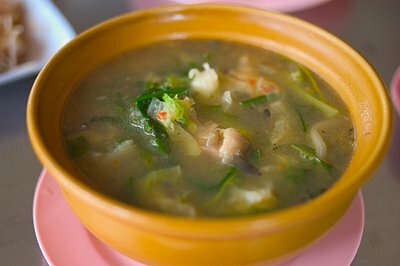 Kaeng om is a type of soup typically revolving around lots of veggies and fresh herbs. This one was loaded with cabbage, lemongrass, basil, and most prominently, dill (known in Thailand as phak chii lao, "Lao cilantro/coriander"). This kaeng om was of the plaa duk, catfish variety.